The bike hitch in front the Keller Williams office is the first of 160 that will be installed throughout downtown. Look for conversion project to commence around the end of March. Some might want the city to ditch the switch, claiming the hitch is kitsch. No so, says Amber Blake, the city’s multi-model administrator whose job includes the unenviable role of parking poobah. Bike parking downtown is a mess, with cyclists locking up willy-nilly to benches, trees, trashcans and, ironically, no-parking signs. The upside-down U-shaped things were supposed to help, but only contributed to the problem. Amber chalked it up to a couple of factors, foremost of which is the cyclist mindset of wanting to park their ride precisely in front of their destination. Sound familiar? Everyone in Durango, regardless of modality, thinks they are entitled to rock-star parking. “But among bike riders, the propensity is even greater than motorists,” she lamented. To make things worse, there are only limited place to install those upside-down U-shaped things. They can’t be installed between parking meters because they block access. Amber, being the multi-model mullah, researched the issue and found many municipalities across the nation solved their pedal peccadilloes with parking-post places. “The big racks in the street, like the ones in front of Carver’s or Mountain Bike Specialists, work great. But there needs to be other individual areas to park downtown. It works best when parking is provided in a uniform way, and the hitches do exactly that,” she said. 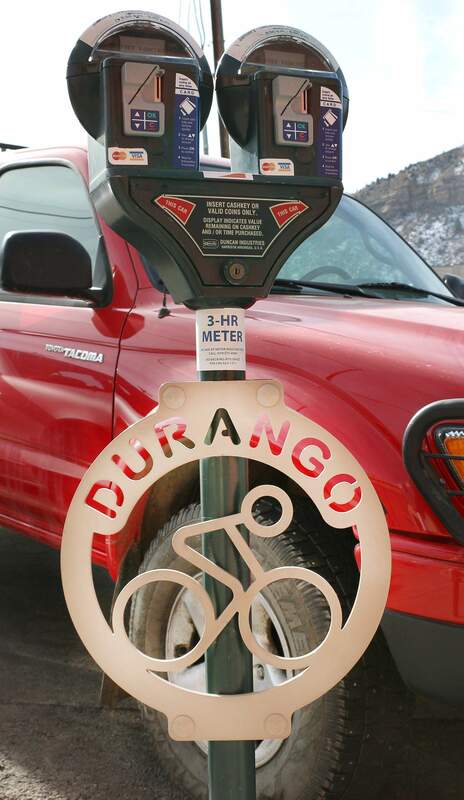 The plan is to install the Durango-branded hitches on every double-headed meter post for four or five blocks on Main and some at select locations on East Second Avenue “and see if it works,” Amber said. The great thing about the hitches? They can be unbolted and moved fairly easily, unlike the U-shaped racks that are cemented into the sidewalk. “We can adjust things as needed,” Amber added. Each powder-coated hitch runs $53, less than half of the cost of the ugly and clunky upside-down U-shaped racks. Amber tried to source the hitches locally, but wasn’t successful. However, she was proud to support American manufacturing. The lowest bidder is a small iron-works company in Blue Bell, Penn., the heart of U.S. steel country. There is only one potential glitch with the new hitch. What if the tourists try to remove them as souvenirs? After all, anything with “Durango” on it is a hot commodity. Maybe the city could wholesale some hitches to some downtown merchants. What visitor doesn’t want a half-price T-shirt, a train whistle and a chunk of metal with a bike on it? Seriously, we might be on to something here. Either that, or the Durango Area Tourism Office could sneak up to Denver and Boulder and just install several hundred without permission as a guerrilla marketing tactic to promote the Iron Horse Bicycle Classic. Email questions to actionline@durangoherald.com or mail them to Action Line, The Durango Herald, 1275 Main Ave., Durango, CO 81301. You can request anonymity if your other bike is a car.